Keep Dry with The Mezen Jacket From Sprayway New For Winter 2018 HydroDRY® waterproof jacket. ever-threatening possibilty of rain, hail, sleet or snow. The Sprayway HydroDRY® technology is a great value alternative to GORE-TEX®, offering breathable waterproofing keeping the wearer warm, dry and comfortable whatever the outing. The technology has been a key part of the brands range since first introduced in 1983, when they became the first company to machine tape non-GORE-TEX waterproof clothing. Inside there is a mesh and taffeta lining for all day comfort, combined with the HydroDRY® technology to allow the body to breathe naturally during outdoor activities and adventures. A grown on, fully adjustable, wire peaked hood gives better protection and visibility in even the most difficult of conditions, and it can be rolled away when not in use. There are three pockets, including two zipped front pockets and an inner hook and loop tabbed stash pocket, keeping all essentials dry, secure and quick to hand. The Whole jacket also packs away into its own pocket, to be easily stashed away when not needed. 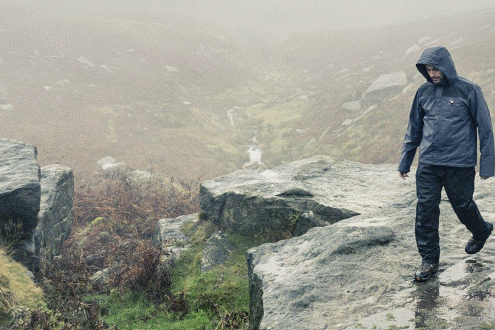 High performing but at great value, the Sprayway Mezen is the perfect jacket for tackling the hills secure in the knowledge that the weather will not be a problem and spoil the day.